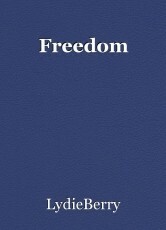 A short story about freedom. The birds’ song was his waking call. A long stretch to order those unruly strings of muscle back to shape. Then he felt the Sun’s light caress upon his cheek and slowly opened his eyes. Oh, the white gold sting of that magnificent star was nearly blinding, however he did not mind. But then swooped in a mass of darkness, a flock of black-winged birds, encircling him and screeching: “Wake up!”. “Up, up, up! One must wake up!” he sang back cheerfully, as he finally kicked off the warm and weighty duvet of his dreams with his spindly legs. When his soles reached the freshly cut, spiky, dewy-cold blades of grass, he felt the wetness cover his skin. It had been so song since he had sensed such a miracle, he dropped to his knees, absorbing each moment. He ran his hands through the tender meadow gathering the life-giving water in his palms, then hurriedly bringing it up to his face so that his nimble tongue could clear up the drops. Their fresh, salty taste covered the roof of his mouth, reminding him of the sea. With his eyes closed he could almost hear the melody of the waves, their teal backs gently embracing the heavy logs. He pulled his thighs close to his chest, allowing the sea to enclose him, and – despite its tremendous strength – softly rock him. He was nothing but a tiny boat, a faithful companion to the old barge. And though sometimes he floundered, forgotten and insignificant, he was satisfied with his fate. He welcomed all passengers who jumped to him from the big ship. Suave, ambitious, true-hearted and silly have all stomped on his planks, but he did not judge them. Oh, he did not have to judge them. The sea did that. It devoured them all. Now he released his legs and leaned back, spreading his arms like a bird. He wanted to fly. The drops left long and cold trails behind as they fell of his skin. He just kept ascending. “Up! Up!” he shouted. He was not a bird. He flew higher than that. He felt like his muscles and bones were made of air. His voice was carried far by the cool wind. Did he travel towards the Sun? No, he passed that long ago. He cruised through the Universe without a purpose. No one could hinder him. The ancient symphony of the planets no longer sang his name. He just dashed through the infinite. Unstoppably. He laughed for the last time, though he knew his voice would echo falsely throughout the centuries. He laughed because he wanted to. He laughed because at last he was also truly Free. - His shoes were snapping deafeningly as he marched down the narrow corridor. As he closed in, the silence went mute. Suddenly he stopped, looking down. Beyond the thin metal bars another one lay. He stepped inside. © Copyright 2019 LydieBerry. All rights reserved.